On Monday July 23rd, Safe Water Ceramics of East Africa (SWCEA) in collaboration with the Association of Water Technologies (AWT), donated five ceramic water filters to the Rotary Club of Arusha-Mount Meru which recently, as part of their charity program, adopted a village in Tanzania. The adopted village will benefit from the ceramic water filters by receiving safe drinking water. 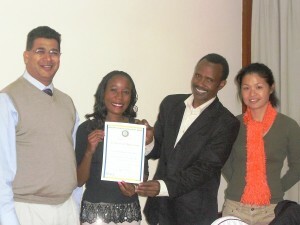 The Rotary Club of Arusha-Mount Meru greatly appreciated our donation and gave Mesiaki Kimeirei a Certificate of Appreciation in that regard. 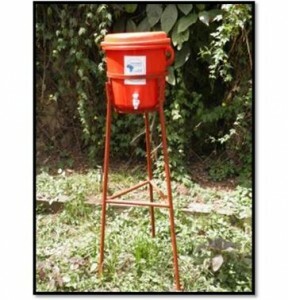 SWCEA in collaboration with AWT will donate more filters to the community in orphanages, school, hospitals and clinics. We are happy to announce that Mr Robert Francu, Managing Director of Kananga Safaris, a premium safari company that has offices in Spain, Tanzania and Kenya (www.kananga.com), did Safe Water Ceramics of East Africa a favor by receiving an order of 1kg of colloidal silver at his office in Spain and bringing it to SWCEA in Arusha. At SWCEA, we make our ceramic water filters from all local materials except for the colloidal silver which we order from a trustworthy source in Spain in order to ensure the best quality. However, this precious component can be lost or delayed in the mail and we wanted someone from Spain to bring it to us directly to save time and the cost of mail delivery. Mr Robert Francu gladly took the responsibility of bringing the colloidal silver to us (in the white plastic bottle). Thanks to him, we can continue producing about 300 filters with it. If you are ever in Tanzania, we would encourage you to visit this beautiful land, including the generous safari company Kananga (www.kananga.com) or others. SWCEA has a new look! We are glad to let you know that SWCEA has a new look! Over the years, our factory and shop esthetic was quite basic but as we are coming into a new phase in this second part of the year 2012, we decided to invest a bit in our looks. Our factory, and shop have now accommodated a small office beside it to be occupied by the General Manager. We are also more visible from the street by potential clients and visitors due to a newly painted roof in blue, where our initials SWCEA have been painted in big white letters. Please visit our contact page, under Directions from Arusha to see a picture of our newly painted roof and factory facade. You are welcome to visit our factory at any time by first getting an appointment via email at: info@swcea.org or by calling +255758937683. It is a bitter sweet time for us as we come to the end of our time in Tanzania. SWCEA has come a long way in the past year. There have been many, many ups and downs as we have tried to grow the business and the road ahead will be no less easy. Finally, I believe we have come to a point where we can say that we have a strengthened filter, a good flow rate and a more consistent firing range. SWCEA will now be able to move ahead with a solid product, and a new manager who will bring strong business and marketing skills to SWCEA. We hope that the coming year will show positive gain and vastly increased sales with her expertise. Our experience here in Tanzania has been priceless. 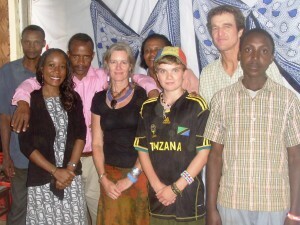 We have learned much from our Tanzanian friends about the value of community and family. Faith in God is strong here and it is the glue which holds everything together. My husband Mike has contributed much to the SWCEA project, donating time and vehicle use to get filters out to teachers. He has enjoyed working closely with Stella, practicing his Swahili during the long road hours. He and Stella are fast friends. My son Izac has enjoyed immensely the camaraderie of his Tanzanian friends who have included him in play and conversation without hesitation. It has been an immensely valuable and unforgettable childhood experience for him. For myself, as a potter, I have been stretched and strengthened by this experience. My connection with Kim will never be forgotten as we faced the production hurdles together. It has been a pleasure to work with this immensely charming and thoughtful man. My dream of returning to East Africa to do meaningful development work has come to pass. I believe in the Ceramic Water Filter as a means for safe water and I have been very happy to have thrown myself into this project body and soul. Thank you SWAN, SWCEA, Tracy, Kim, Stella and all the wonderful Ngulelo friends we have been so happy to have shared a year with. Best of luck to you SWCEA – May you grow and continue to provide Safe Water to those in need. 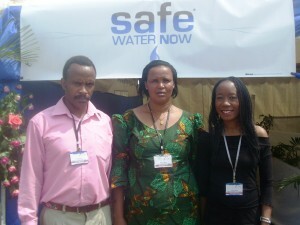 Safe Water Ceramics of East Africa was pleased to attend the Karibu Trade and Tourism Fair from 8th June to 10thJune 2012. Stella and Mesiaki Kimerei attended all 3 days of the event and were present to explain and demonstrate how the filter works both in English and Kiswahili. We were at stand W11 and received much interest in our ceramic water filters. Many people purchased our filters for their home use and/or to give as a gift to local families that are boiling water right now as a means to get safe drinking water. Special thanks to Rob Barbour, manager of Afrika Safaris ( www.afrikaafrikasafaris.com), who purchased two filters to be used at his campsite – they are environmentally friendly and ecological as they promote sustainable safaris. 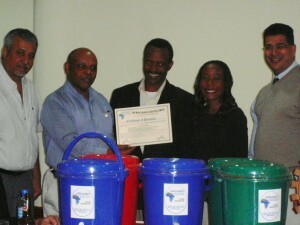 Also special thanks to Chris Pilley, director of B2B Bush and Beach Safaris, who purchased four filters to donate as part of his charity program (www.africarootsfoundation.org). The Karibu Fair is an important event in the town of Arusha, and happens once a year around the same month. Many exhibitors and participants attended. Please use our contact information on our website www.swcea.org if you are interested in purchasing our ceramic water filters or to donate to our cause. From Leslie – We arrived in Tanzania to a wonderful welcome from the Kimieri family which left me speechless. My husband Mike, my son Izac and I were all given hugs of welcome, and a huge bouquet of flowers each. The welcoming committee was so large as to make us wonder how we were all going to fit into the rented van to get back to Arusha. We managed to squeeze in and make the hour trip back to Ngulelo, Arusha and the start our life here in Tanzania.